Photogravure John Andrew & Son from copyrite photograph 1910. Museum mounted, handsomely presented floated on acid free matts, glazed, dark-stained oak frame. The right profile portrait shows Apuyotoksi ("light-colored kidney") wearing a wolf-skin war-bonnet. Yellow Kidney was regarded as a man of high honour, as it was he that owned the medicine pipe of the seizers or catchers society that had come to the Piegan from the Siksika (the Alberta band of the Blackfoot). He also owned a number of painted lodges. His honoured status as a warrior is ably captured in this fine portrait. The Piegan Nation (aka. Piikani Nation) were part of the Blackfoot confederacy which prior to 1870 occupied territory on both sides of the present day US/Canada border in Montana and Alberta. 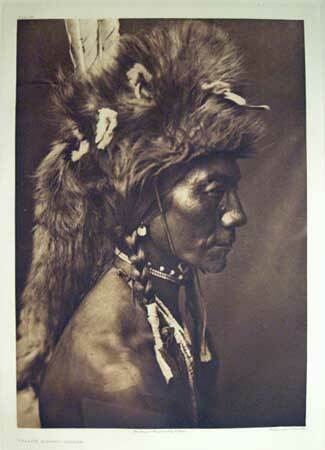 In 1906, J. P. Morgan provided Edward Sherrif Curtis with $75,000 to produce a series on Native Americans. This work was to be in 20 volumes with 1,500 photographs. Morgan's funds were to be disbursed over five years and were earmarked to support only fieldwork for the books not for writing, editing, or production of the volumes. Curtis himself would receive no salary for the project, which was to last more than 20 years. Under the terms of the arrangement, Morgan was to receive 25 sets and 500 original prints as his method of repayment. The North American Indian originally appeared as 20 bound volumes incorporating 1503 small full-page photogravures (image size app. 6 x 8”), and 20 accompanying portfolios comprising 723 large photogravures (image size app. 11 x 14) printed on 18 x 22” sheets of various papers: tissue, Japan vellum, Holland (Van Gelder). There are 2226 images printed as hand puld photogravures in THE NORTH AMERICAN INDIAN (1906-1928), considered the most lavish and elegalently illustrated set of photographic books ever produced. Curtis raised and spent millions to create it. After the completion of The North American Indian in the 1930s the project went into bankruptcy and the photogravure plates and unsold stock were purchased by Lauriat’s Bookshop of Boston. Lauriat’s began manufacturing posthumous photogravures from the original plates to fill in a dozen incomplete sets in the late 1960s, and since that time there have been numerous posthumous editions of photogravures (from the original plates) which are easily mistaken for original edition prints. The above image has an artificial plate mark and the paper is a modern quality fine art paper. The plate size of the original 1910 photogravure as held in the U.S. Library of Congress and North Western University is 46 x 33 cm. Recent Printing History-Within the last 20 or so years, two companies have produced commercial restrikes. These are very easy to identify: The American Express Company issued approximately 20 different volume prints on "Arches" paper (also known as Rives BFK paper), a markedly yellow, commercially produced paper that was smaller than the actual 12"x 9" original Curtis volume dimensions. Also, in the late '70's and early '80's the Classic Gravure Company of Santa Fe, New Mexico, released a series of prints on "Classic" paper. These are readily identified due to the "CG" and "E. Curtis" signature watermarks. In 1980, they released a beautiful oversize folio (14.25" x 10.5") volume with images from several different groups. They had planned to reproduce Curtis' entire 20 volume set, but unfortunately after completion of only 228 of 250 copies of the first book, they went bankrupt. They also begin a print-run of the folios, but went out of business before completion of the series. In 1982, the original Curtis plates were purchased by The Curtis Collection, the present owners, who have released more restrikes of select volume and portfolio gravures. The Curtis Collection purchased the remaining inventory of Classic Gravures restrikes, but prints their own gravures only on Arches paper (and in a larger 11" x 14" format). A final word about restrikes-while these are not "authentic" or "vintage" Curtis gravures, they should not be considered "fakes" or "knock-offs." They are very fine archival photogravures made from Curtis' original plates, often produced in limited editions. They therefore provide an affordable alternative to purchasing an original photogravure. E Curtis signature & CG watermarked paper. Museum mounted, handsomely presented floated on acid free matts, glazed, dark-stained oak frame. In this full length portrait of the then young Sun Dance priest in 1900, he is wearing a split-horn weasel headdress with a feather trailer (instead of his more familiar straight up bonnet) over his shoulders and in front is a split otter pelt, possibly representing a transfer. Within his crossed arms is a pipe tomahawk, whilst from his right wrist hangs a red fox skin, which may have represented a transfer from the old Kit Fox Warrior Society. 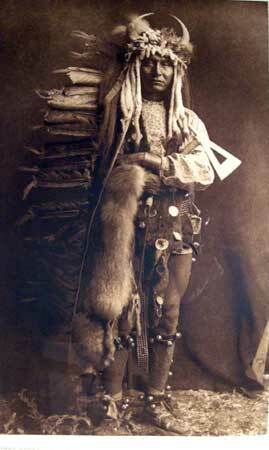 He was a full blood indian born in 1876. both his wives and four children died of tuberculosis. He died in 1957. This image captures the warrior turned farmer in a noble pose. The Piegan Nation (aka. Piikani Nation) were part of the Blackfoot confederacy which prior to 1870 occupied territory on both sides of the present day US/Canada border in Montana and Alberta. [Originally published as PLATE 206 in PORTFOLIO 6 ] In the late 1970's and early '80's the Classic Gravure Company of Santa Fe, New Mexico, released a series of prints on "Classic" paper. These are readily identified due to the "CG" and "E. Curtis" signature watermarks. In 1980, they released a beautiful oversize folio (14.25" x 10.5") volume with images from several different groups, but went out of business before completion of the series. E. Curtis signature & CG watermarked paper. Museum mounted, handsomely presented floated on acid free matts, glazed, dark-stained oak frame. The Assiniboine were originally part of the Great Sioux Nation which was made up of Eastern Dakota or Santee, Western Dakota or Yanktonai, and the Lakota or Teton Sioux. The Sioux were pushed gradually westward onto the plains from the woodlands of Minnesota by the Ojibwe people who acquired guns earlier from their French allies. Specifically the Assiniboine were part of the Yanktonai Sioux but split off around 1640 and headed north where they developed into a powerful and distinct people. The Assiniboine acquired horses by raiding and trading with neighboring plains nations such as the Crow and Sioux living further south who obtained horses earlier. The Assiniboine eventually developed into a large and powerful people with a horse and warrior culture centered on the vast numbers of bison that lived within and outside their territory. Assiniboine territory at the height of their power stretched from the North Saskatchewan River in the north to the Missouri River in the south and included portions of modern day Saskatchewan, Alberta, Manitoba, North Dakota, and Montana. [The above imge was originally published as PLATE 101 in PORTFOLIO 3 ] In the late 1970's and early '80's the Classic Gravure Company of Santa Fe, New Mexico, released a series of prints on "Classic" paper. These are readily identified due to the "CG" and "E. Curtis" signature watermarks. In 1980, they released a beautiful oversize folio (14.25" x 10.5") volume with images from several different groups,but went out of business before completion of the series. Going to Washington / Returning to his home. Hand tinted stone lithograph Matted glazed black and gilt wood frame. 19 3/8 x 12 7/8" inc. letters ( 49.2 x 32.7cm. ) 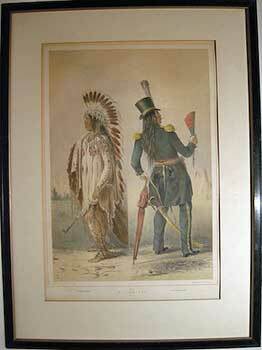 Frame:26 5/8 x19 1/2"
This man was taken to that city in 1832, in a beautiful Indian dress, by Major Sanford, the Indian Agent, and returned to his country the next spring in a Colonel's uniform. Eighteen months later, the artist met Pigeon's Egg Head on his return home to the northern Plains. In this before-and-after portrait, Catlin shows the Assiniboine arriving in Washington in a splendid buckskin suit, as noble and classic in its own way as the architecture of the Capitol in the background. On his return, dressed in a "general's" uniform accessorized with umbrella, fan, and bottles of whiskey, all gifts of the government, he made a far less harmonious sight. The final indignity was "a pair of water-proof boots, with high heels, which made him 'step like a yoked hog.'" His tribesmen rejected his descriptions of the white man's cities, and his persistence in telling "evil lies" eventually led to his murder at the mouth of the Yellow Stone. Catlin's message—civilization destroys Indian culture—doesn't get much clearer than this. 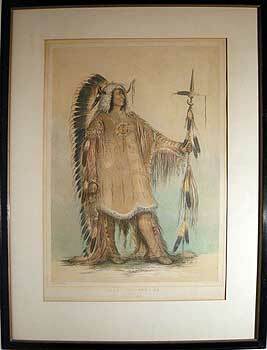 George Catlin (1796-1872) created paintings of the American Indian in a series of paintings over the course of numerous trips during the 1830s. He recreated many of those paintings in outline lithographs. These beautiful works have come to us through a series drawn on stone by McGahey after George Catlin and published by Day & Hague, London, 1844. A few of these were hand-coloured and command prices in the thousands of dollars. Louis Haghe (1806-1885) was a talented lithographer and watercolour artist. Together with William Day, (1797 - 1845) he formed Day & Haghe which was the most famous early Victorian firm of lithographic printing in London in 1829. Day and Haghe printed lithographs dealing with a wide range of subjects, such as hunting scenes, topographical views and genre depictions. In 1838, Day and Haghe were appointed 'Lithographers to the Queen'. After William's death in 1845, the firm became known as Day & Son. They were pioneers in developing the medium of the lithograph printed in colors. 19 1/8 x 12 3/4" inc letters (48.6 x 32.4 cm. ) Frame: 26 5/8 x 19 5/8"
Máh-to-tóh-pa, Four Bears, Second Chief, in Full Dress, Mandan/Numakiki "No tragedian," Catlin wrote, "ever trod the stage, nor gladiator ever entered the Roman Forum, with more grace and manly dignity" than did Four Bears as he arrived for his sitting. He wore embroidered deerskin leggings and a shirt decorated with pictographic accounts of his war feats. His headdress of eagle feathers and ermine was crowned with buffalo horns, which convey his "exceeding valour, worth, and power." Catlin rewarded him with a splendid likeness that is one of the most influential American portraits ever painted. This extraordinary man, though second in office, is undoubtedly the first and most popular man in the nation. Free, generous, elegant, and gentlemanly in his deportment; handsome, brave and valiant; wearing a robe on his back, with the history of all his battles painted on it, which would fill a book of themselves if they were properly enlarged and translated."